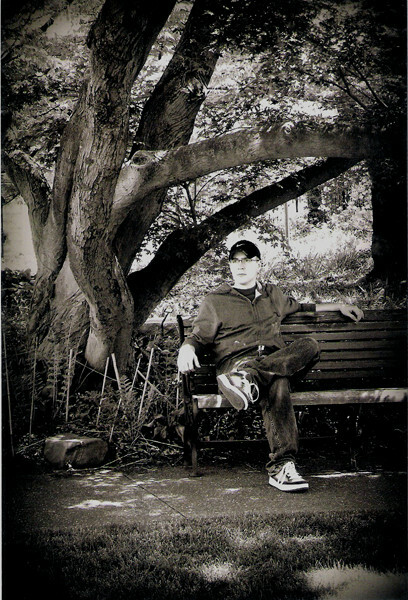 Daniel J. Dombrowski is an author, editor, and indie publisher. He recently founded 33rd Street Digital Press, an independent publishing company, and he has been working for the last several months on Nonlocal Science Fiction, a quarterly anthology that features short stories and serials from new and established authors from around the world. Dan, thank you so much for being here. Before we talk about your WIP, why don’t you tell us a few things about yourself? Hi, Maria! Thanks for taking the time to talk to me. I never know where to start when people ask me about myself. I’ve been on a bit of a crooked path for several years. I went to school for anthropology – archaeology, really. I graduated with a Master’s from Penn State in 2009. I think I thought I could be Indiana Jones or something overly romanticized like that. The reality is that archaeology is a lot of digging holes in the hot sun and finding nothing. It’s pretty miserable a lot of the time. I moved to Pittsburgh shortly after I graduated and married my high school sweetheart. I worked anywhere that would take me for the next four years as my wife finished her doctorate and two years of residency. We recently moved back to our hometown, Erie, Pa., and I’ve been able to work primarily on my own projects while my wonderful wife keeps things a bit more legitimate on the faculty at a school of pharmacy. I edit on a freelance basis for a self-publisher (about 500 pages per month), and for the last six months or so, I’ve devoted a lot of time and energy towards starting up my publishing company and launching Nonlocal. The first issue of Nonlocal is mostly in the bag. I’ve received dozens of submissions since first putting out the call back in October, and I have what I think is a pretty stellar lineup of nine stories from authors spread around the globe + one of my own. My main focus at the moment is a Kickstarter to help launch the first issue in style. I have some big plans for the publishing company and Nonlocal, but it’s a one-man enterprise aside from the authors. I’ve boot-strapped everything to this point, and I’m ecstatic about the results. I want to see it come to life in a big way, and a successful Kickstarter will make that possible. Let’s all pitch in then! Are you happy with the pace of your work? Do you aim at a specific word count each day? 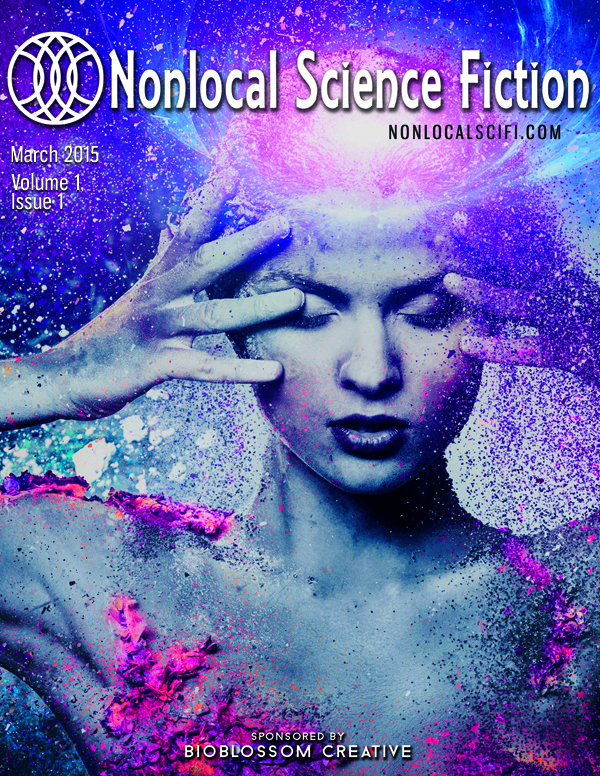 I’m thrilled at how quickly the first issue of Nonlocal has come together. I first put out a call for submissions in October, and I got 50+ submissions before the end of the year. It’s a bit nerve-wracking to wait for submissions. Will there be enough? Will any of them be any good? I think I’ve been more than a little lucky. As far as a word or page count, it depends on the project. When I’m editing for the self-publisher, I try to do a minimum of 50 pages per day, which depending on the project is either a few hours or a sun-up to sun-down proposition. I try to read and get a response out for submissions to Nonlocal inside a week, though I have been falling short on that a lot lately. Editing accepted stories is very individualized. Sometimes they only require a light polishing. Other times I’ve taken stories from rookie authors that I really believed in and have given advice for some pretty substantial rewrites. That part is fun for me. I love helping out new writers and transforming a rough piece into a real gem..
As far as writing, copy for the website/blog is usually 2000-3000 words per week. On the odd day when I find time to work on my own fiction projects, I shoot for 3000 words if I can go the whole day on it, though that rarely happens. I definitely aspire to be a plotter. I have all sorts of fancy calendars and spreadsheets and to-do lists, but I have so many plates spinning at once that I’m frequently forced to be a pantser, unfortunately. Maybe that will change someday soon, but I doubt it. Second-guessing myself and trying to start editing and revising before I’m finished. I used to write with an outline, but I always found that the end product suffered and sounded very formulaic. I tend to write without a net anymore, but I often change my mind about some particular plot element or character and can’t resist going back and making the change immediately. This invariably leads to rewrites and revises of entire sections and chapters before the full story is even written. Have you ever experienced lack of inspiration or drive to write? If so, how do you motivate yourself? When I first started, I was pretty naïve. I expected quick success, and when my first attempts were rejected by magazines like Asimov’s and Analog, I walked away from writing for a bit. From beginning to end, that first period of writing, submitting, and getting a dozen or so rejections probably lasted about 18 months. I got back into writing by exploring some other paths. As I’ve already said, I started editing for a self-publisher, which has been a huge blessing. You learn a lot by reading and recognizing mistakes by others. It’s hard to get better if all you ever do is read polished novels by professionals and your own stuff all the time. I also worked on a couple magazine projects. One was a great regional human interest mag called Rustbelt Almanac. We profiled hip small business owners who were helping to breathe economic life back into cities like Detroit, Cleveland, and Pittsburgh which have all had to transform and move away from their manufacturing roots. Rustbelt, even though it never quite caught on, was a really high-quality publication, and it got me back into writing in a big way. I didn’t have stories of my own that I wanted to tell at that point, but I was able to help tell the stories of others. It was a lot of fun. My desk is actually a shelf from under an old IKEA coffee table with four modular legs attached. I love having a big work surface, and the lack of drawers and shelves and all of that eliminates a lot of distractions. I have a dual-monitor setup for my desktop, which I find indispensible with all of the different projects I have going. You can probably see a microphone and a small mixing board. I’ve been dabbling with home recording, and I hope to have the first episode of a podcast out soon with general talk about indie publishing and interviews with authors from the magazine. I love your detailed description. Now this image is pinned on my Featured Writers’ Workspace board on Pinterest.Apart from Word and Google, do you use any other writing or research tools and apps? My websites are all built on WordPress, and I do layouts on a publishing platform called Serif PagePlus. I keep track of blogs with Feedly, and I use the free version of Hootsuite for my social media post scheduling. As far as writing/editing references, I stick mainly to hard copies. I pull out The Elements of Style and The Chicago Manual pretty frequently, as everyone should. I haven’t thought that far ahead yet. Probably with a nap. Maybe with a shot of bourbon. Perhaps both. I connected with an awesome cover design company called Bioblossom Creative recently. They designed the cover for the first issue of Nonlocal on spec so that I could do a cover reveal during the Kickstarter. Other than that, though, it’s just me and the authors. I’m handling all of the publishing and the bulk of the marketing, including coordinating some collaborative marketing efforts with the authors. Be genuine and never stop trying new things. If you’re an indie author and you feel like you aren’t making much progress, it can be easy to just start phoning it in with nothing but scheduled “Buy my book!” posts on social media. But the second you stop actively engaging with your audience, no matter how big or small it is, you’ll lose all momentum and probably lose a lot of that audience that you’ve worked so hard to build. When I have a day when I feel like everything I’m doing is pointless and isn’t getting results, I try something new. I find a new social sharing tool. I seek out a new group on Facebook that shares a common interest. I come up with some new way to connect with people on Twitter or somewhere else. There’s no big magical secret that I’m aware of (other than maybe having a million-dollar marketing budget). It all comes down to who has the motivation to keep at it and keep trying new things until something works. Is science fiction the genre you will stick to or do you see yourself branching out in the future? As far as my personal writings, I don’t have much of a desire to expand out of science fiction. That could always change, but I doubt it. As for publishing, I’m starting in sci-fi because it’s a home base for me. I know good science fiction when I read it, and I don’t have to second-guess myself when I read submissions. That said, if the Nonlocal model is successful (and I haven’t even talked about the profit-sharing side of things, check the website for info on that), I’d like to expand into other genres. Whether I’ll be able to do that on my own or if I’ll need to find other editors remains to be seen. Dear readers, I’m sure you appreciate Dan’s effort with Nonlocal. Please consider helping his Kickstarter project. Thank you, Dan, and best of luck. Informative and helpful interview! 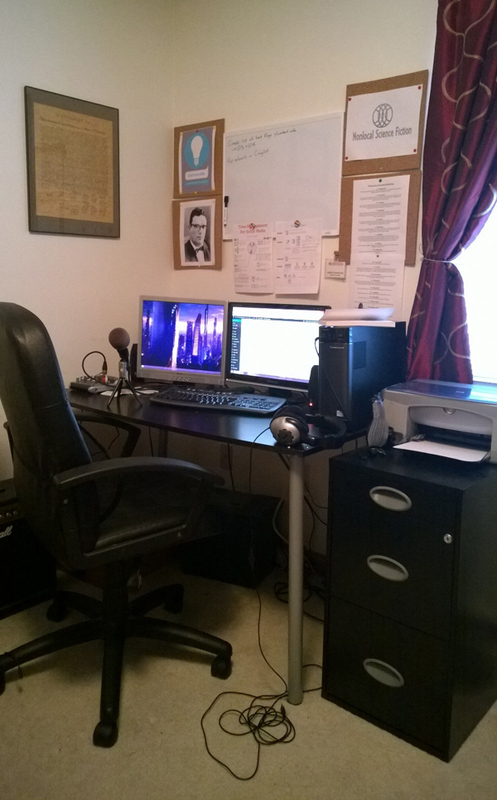 Thanks for sharing, I loved how Daniel described his desk area. All best! Thanks! There’s a short story about an old loner guy living in the US as Europe is devastated by a plague. As more and more people die, the fabric of reality starts to fade away because, in the reality of the story, only our collective awareness of our world is what keeps it from dissolving into nothing. At the end of the story, the old loner guy is the last person left alive, sitting alone in his house which he knows so intimately that he can hold it together all on his own. I feel, as a lot of writers probably do, that my desk would probably be that last little corner left in an unraveling universe. That’s a unique approach that says a lot. Thanks, Daniel. Thanks for stopping by, Katina. I also appreciated Daniel’s detailed description.